This month, Chewy.com offered a truly delightful array of products for bloggers in the Blogger Club to review. We chose Merrick Mini Brush Bones, because I love having tasty dental chews around to help Lamar maintain his aging but still healthy smile. 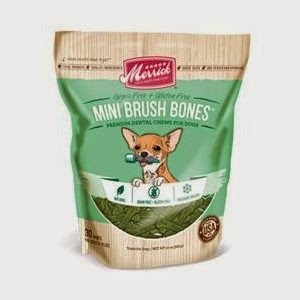 I've heard bad things about Greenies getting lodged in dogs' intestines and requiring surgery to remove, so "highly digestible" is a selling point for these mini brush bones. The other selling point is that Lamar really seems to love this genre of plastic-like, hard things advertised as "dental chews," so I jumped at the opportunity to get some in exchange for a review. and once ingested they were gone in a flash. but there was no time to even get out the stopwatch. A testament to the deliciousness of these mini brush bones, although it does call into question whether there was time for a whole lot of dental cleaning to take place. For that, it may be time to break out the good ol' toothbrush and scrub. Poor Fozzie, the old guys get all the good stuff. OK buddy, eat your dinner and you can have a Mini Brush Bone too. Thanks Chewy.com for the proof that oral hygiene can be fun! Labels: Chewy.com, Lamar, product review! I recently noticed Honey's breath was a bit whiffy. I've started brushing her teeth although the vet thinks her teeth look pretty good. I'm sure Honey would much rather be given a green treat than have me sticking a brush into her mouth every night. I chuckled as I read your post - I too have wondered at the dental benefits when the treat is consumed so fast. Gotta admit, I don't buy them, we stick with the hooves and Nylabones. Treats are always homemade.